See this page for the Quick Reference card. The 79th legislature passed HB 7 that enacted Texas Insurance Code Chapter 1305. Chapter 1305 authorized the establishment of workers’ compensation health care networks for the provision of workers’ compensation medical benefits. 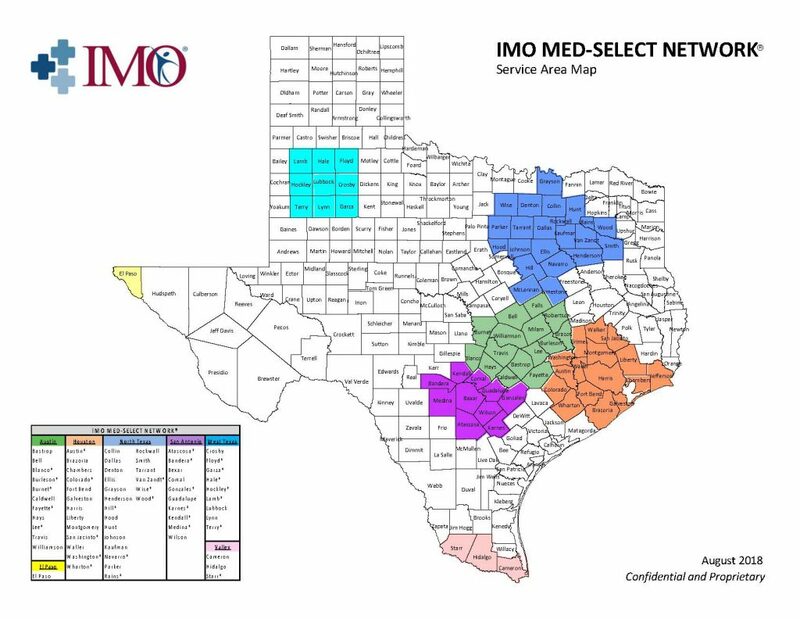 The State Office of Risk Management has contracted with the IMO Med-Select Network® to assist employees in the selection of network providers while obtaining prompt and appropriate medical treatment. With a return-to-work focus, the IMO Med-Select Network® has credentialed and contracted with varied health care professionals. Except for emergency care, employees who live within the IMO Network coverage area will be required to obtain medical care from a network provider in order to receive workers’ compensation benefits. We understand you may have questions regarding this transition and have prepared the following resources as educational tools on this page. All new injuries that fall within the IMO Med-Select Network® coverage area are required to treat within the network. SORM and IMO are making every effort to ensure the transition is as seamless as possible. Each agency must continue to designate a Health Care Network contact and enter the person’s information into the online Risk Management Information System (RMIS). This individual will continue to receive periodic updates, as well as e-mails and educational material regarding the network. Please pay special note to the HCN Employer Network Information Packet available in PDF on this page. How does the network benefit me as an employee? SORM has contracted with the IMO Med-Select Network® to provide state employees, who live in network service areas, the opportunity for improved quality of care and help in returning to work as soon as medically appropriate. Additional resources can be found below. Please pay special note to the Employee Network Notification Packet available in PDF on this page with required documents for review and signature when appropriate. Based on the employee’s county of residence, an employee is considered “in-network” or “out-of-network.” If an employee is accessing the CompKey+ HCN prior to September 1, 2014 he or she may or may not be in the IMO Med-Select Network® due to the specified coverage area. It may be necessary for an injured worker who is moving from the CompKey+ HCN to the IMO Med-Select Network® to choose a new treating doctor if their current treating doctor is not in the IMO Med-Select Network®. No change of treating doctor is required if the employee lives outside of the IMO Med-Select Network® coverage area. If an employee does not live in a network county, but wishes to participate in the network, he or she must complete an out-of-network participation form provided by his or her adjuster. You may always contact SORM directly at 1-877-445-0006 regarding any workers’ compensation questions or concerns.